Ships to: The US + Worldwide! Check out all of my Loot for Her reviews! This subscription comes with an info card showing all the Loot Wear items for the month. Now, on to the item! Verdict: I think Loot for Her consistently delivers great exclusive designs every month and I love that you can preview the fandom and skip any month you aren’t interested in. BUT! Loot Crate has been having shipping issues all year, so I would only recommend this subscription if you are OK with getting your shipments late. I really hope they straighten out their shipping issues soon, because I’m almost always impressed with the items they send, but I know subscribers are getting understandably frustrated by the delays. 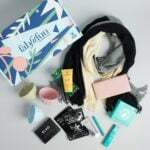 What do you think of the November Loot for Her subscription? How do subscribers rate Loot For Her? Do you subscribe to Loot For Her? Add your rating now! Steven Universe is pretty much the only cartoon I actually watch, so yes, I highly recommend it! I skipped this month because I think I have gotten at least 4 scarves from lootwear already this year. I don’t watch this show but it looks cute. Steven Universe is amazing! It’s goofy, but has a sweet and serious story line. The music is also awesome too! One of the main characters is voiced by Estelle. Rebecca Sugar (the creator) used to write for Adventure Time, but it’s not as weird as that show is. One of the most positive and empowering shows out there. OwlCrate Subscription May 2019 Theme Spoiler + Coupon! Pearlesque Box May 2019 FULL Spoilers + Coupon Code! OwlCrate JR May 2019 Theme Spoiler + Coupon! Boxycharm Limited Edition Skincare Box Spoiler #3!